Black cumin seeds acts as a medicine to so many diseases and it has essential acids too. Especially it contains protein, Calicium, Iron, copper,zinc, Phosphorus, Vitamin B1, B2 and B3. 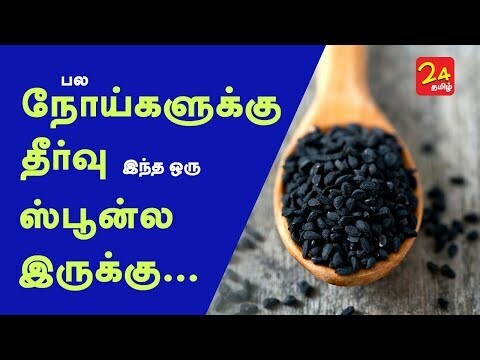 It cures 40 types of diseases and let us see what is more special about it in this video. When we add black cumin oil in food it cures stomach pain and bloating stomach. It flushes out the waste from the body and prevents bacterial infections and kills intestine worms. Mix 1 tsp of Black cumin powder in hot water, add honey take it twice a day to dilute kidney and gall bladder stones. Use black cumin to cure prolonged cough, cold and asthma problems. Mix little honey with 1 tsp of black cumin powder and 1/2 tsp of crushed garlic and it will cure these problems. To cure nose block heat 50 ml coconut oil with 1 tsp of black cumin powder. After filtering if you put 2 drops of this oil nose block will not be there. The chemical substance in black cumin improves our immune power. And it has good cholesterol and reduces bad cholesterol. Some women may have menstrual problem they can fry little black cumin and powder it. Take 1 tsp of this powder mixed with honey or palm jaggery 10 days before menstrual period to get rid of menstrual cramps. Black cumin controls pancreas cancer,it strengthens the bones and prevents cancer tumour. Cancer patients can take black cumin seeds with honey or hot water. After three days of delivery to remove the dirts from uterus new mothers can make balls with 1 tsp of black cumin with palm jaggery. And eat it twice in a day for 5 days continuously.